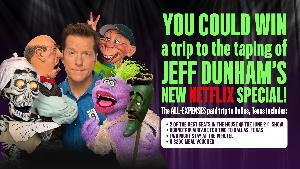 Contest: All-Expenses Paid Trip To Jeff Dunham's Netflix Special Taping! All-Expenses Paid Trip To Jeff Dunham's Netflix Special Taping! Prize: The lucky winner will get 2 round-trip airfare tickets to Dallas, a 2 night stay at the W Hotel, airport transportation, $200 for food, and 2 of the best seats in the house! Statistics: This contest was opened by 122 and entered by 19 ContestChest.com members. 16% of those who opened the contest, entered it.